De-thatching, or commonly called as power raking, is best done in spring to pull out dead organic matter in your lawn. A thatch layer of up to 0.5 inches is actually beneficial to keep your lawn in good shape as it will help protecting the grass roots from direct sunlight and the harsh elements. Power raking done too late in the season can actually harm your lawn unless you’re planning on a lawn renovation project. 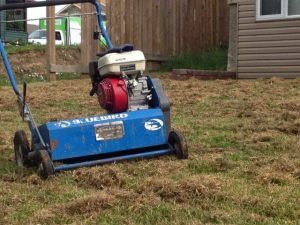 The power rake will not reach into every corner of your lawn, especially in tight areas. That’s why we handrake those areas with a special de-thatching rake. After we’ve run the machine the pulled out dead grass is then raked up and disposed. For full benefits the grass should be fairly dry. To protect your sprinkler heads from machine impact they need to be flagged so we can go around. The machine is sprayed with sterilizing liquid after every yard to reduce risk of cross contamination. Nobody likes Fairy Rings…those mushrooms growing in circles!